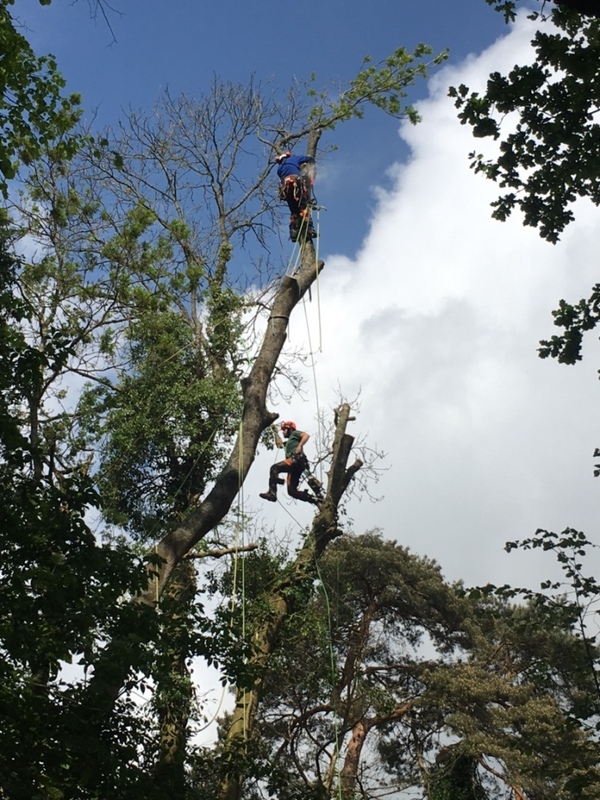 Home>Scott Fraser Training Blog>Tree Surgery Contracting Project in Mayfield, East Sussex – links to rigging & chainsaw training. 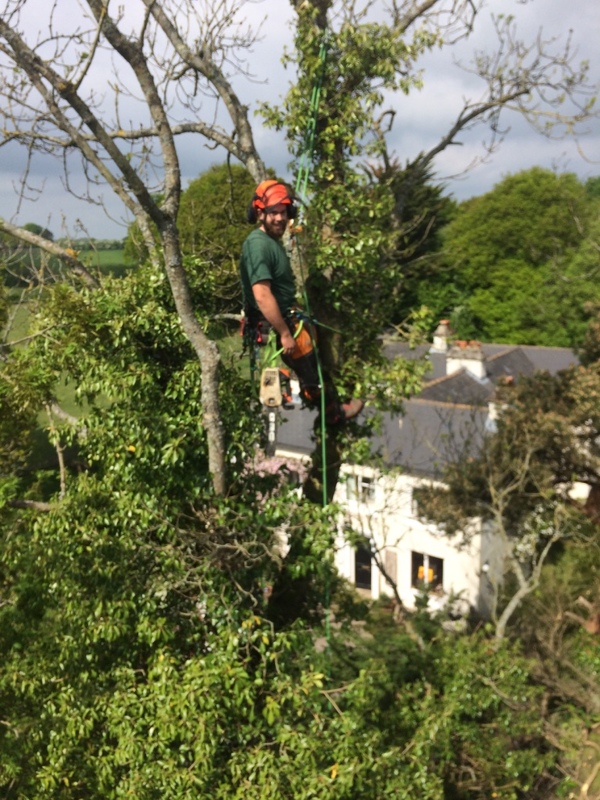 Whilst at a higher technical level than the many courses we typically deliver, a complex forestry contracting job does help to illustrate many of the principles of organised, safe and efficient treework at height. 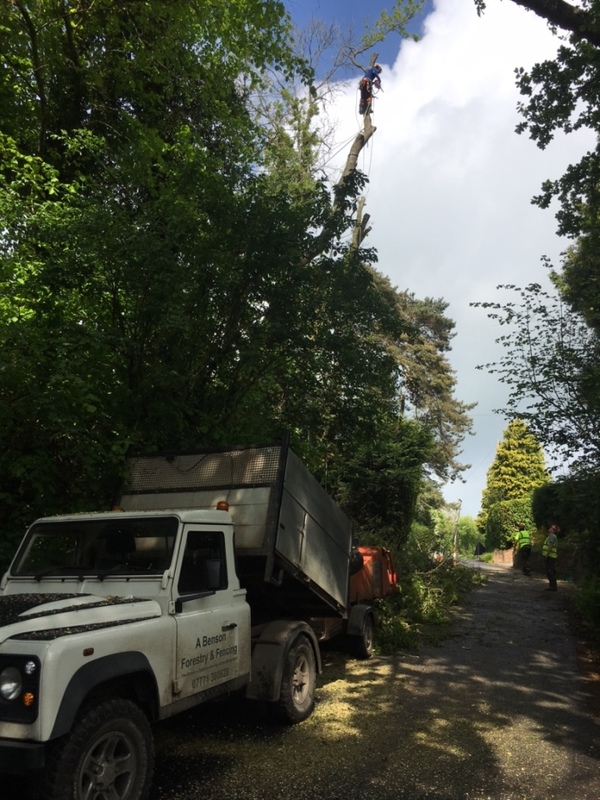 I was asked to assist with some climbing on a job in Mayfield, East Sussex involving the removal of a group of semi mature Ash Trees growing on a steep bank. One had recently failed completely, one had leant into an adjacent lime and the others were growing in a coppice group. Firstly the project was looked at in detail to determine the options for completing the tasks and the best way to resource the job. 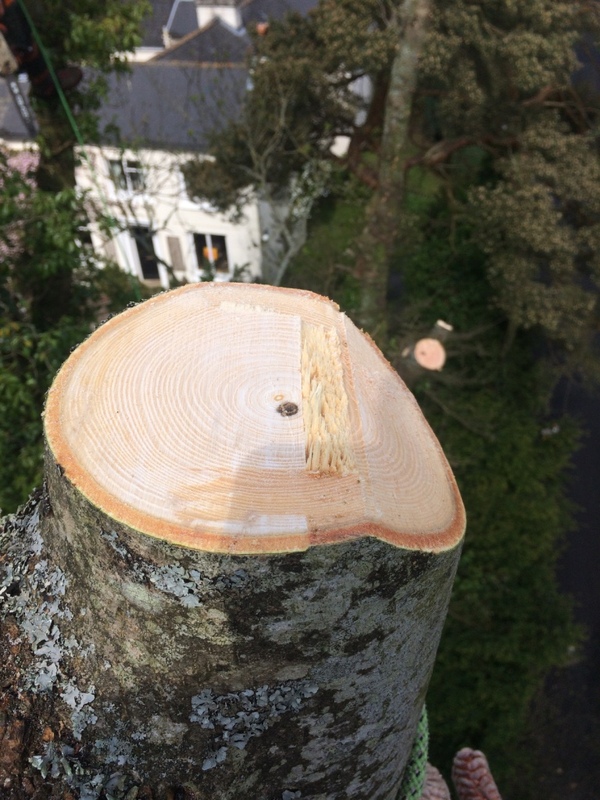 A great resource for this overview is the Arboricultural Association’s Industry Code of Practice for Arboriculture at Height. I was allocated the leaning ash so I installed a SRT line (Yale Kernmaster). 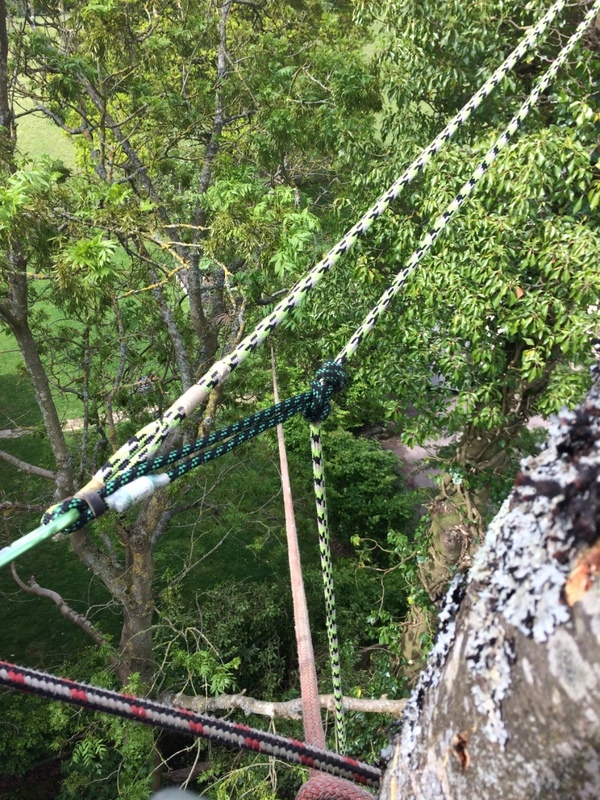 I then pull tested this line from the ground with two people but because of the steep slope, lean and potential rigging forces, I decided to install two stabilising lines to the rear onto a strong oak and lime anchor points respectively, at around 50% of the tree height. These were set to have a neutral impact on the tree, but came tight when loaded with slight forward tree movement. The GRCS was set up at the same time. Following this rather long winded stabilisation set up, I re-ascended the tree and took out a few lighter low branches using the X-ring. I then used this up to redirect the 16mm Tuefelberger Sirius rigging line close to the stem (to minimise leverage forces) and choked a small DMM impact block at the top. I did this on an upright but slightly sub-dominant section, allowing the climbing lines to be separate. The next job was to take out some top weight, the main mid-level lateral and finally the top limbs. With the stem left to deal with, I lowered the top two stem sections and moved into free fall step cuts in smaller manageable sections that could be pushed clear of a BT wire below. The job as a whole was lot easier because of the high anchor point from the adjacent tree that was made available by one of the team members, Alex, who kindly installed it for us. This fitted into his free fall removal of the first two upright stems. 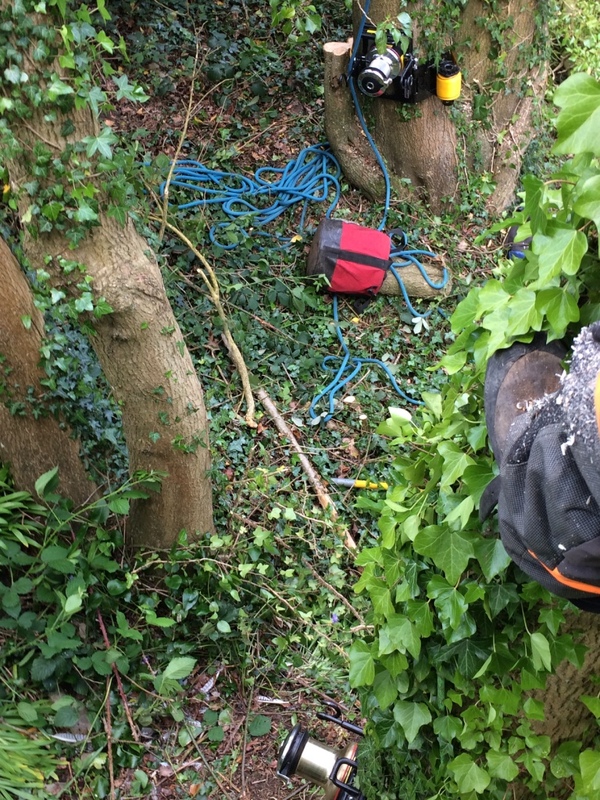 With some great rigging ground work and clear communication from the team, we got the drop zone free promptly, and smoothly lowered sections using the electric top handles saw for the branch cuts. 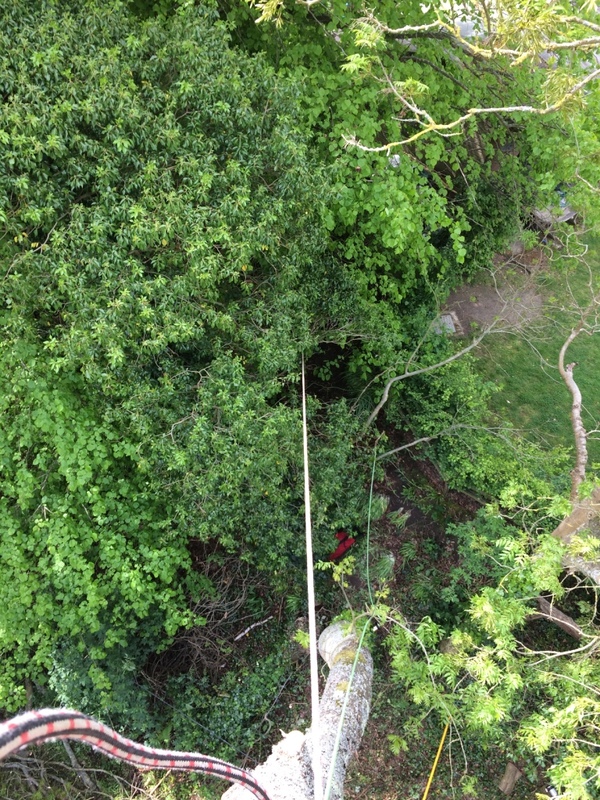 Meanwhile, Alex fought his way up a multi stemmed and ivy clad ash – nice. I headed up the lime using a ‘big shot’ to fire the throwline over the top, allowing use of an SRT up the outside of the tree. Once in position, I installed a second climbing line (to backup, and allow greater positioning options) and proceeded to handsaw the light material clear to check the ash and lime interaction. The main ash stem was then secured with a supporting tensioned line to the GRCS. This revealed two key branches on the ash under compression, which were first secured and then cut using an ‘increasing v’ technique on the compression side. I then decided to remove ivy from the ash before finally, taking a couple of stem sections off. This left an angled stem clear of the lime, which was then ‘soft felled’ and carefully lowered to the ground using the GRCS. I had an interesting and enjoyable day with the team on the A Benson Forestry & Fencing job and we even got quality coffee and pizza, not like in the old days!